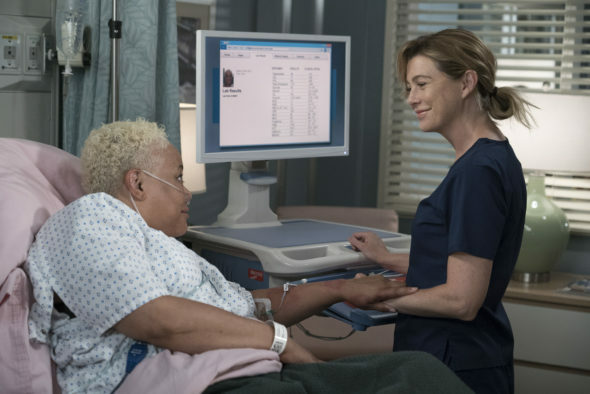 Does Meredith find her bliss in the 15th season of the Grey’s Anatomy TV show on ABC? We all know that the Nielsen ratings typically play a big role in determining whether a TV show like Grey’s Anatomy is cancelled or renewed for season 16. Unfortunately, most people aren’t part of that system. Because many viewers feel frustrated that their viewing habits and opinions aren’t being counted, we’re offering you a chance to rate the season 15 episodes of Grey’s Anatomy below. A high-intensity medical drama series that airs on ABC, Grey’s Anatomy stars Ellen Pompeo, Justin Chambers, Chandra Wilson, James Pickens Jr., Kevin McKidd, Kim Raver, Jesse Williams, Caterina Scorsone, Camilla Luddington, Kelly McCreary, and Giacomo Gianniotti. Though this series has been on the air for 15 seasons, there is still plenty of personal and professional drama to come. Meredith Grey (Pompeo) and the other doctors at Seattle’s Grey Sloan Memorial are faced with life-or-death decisions on a daily basis. This team of healthcare professionals share friendship and sometimes, even more. Together they discover that neither medicine nor relationships can be defined in black and white. What do you think? Which season 15 episodes of the Grey’s Anatomy TV series do you rate as wonderful, terrible, or somewhere between? Should ABC cancel or renew this TV series for a 16th season? Don’t forget to vote, and share your thoughts, below. More about: Grey's Anatomy, Grey's Anatomy: canceled or renewed? Grey’s has become the new American classic! Can’t stop now, you guys! Greys is my favorite show!!!! Grey’s Anatomy continues to be my favorite show with This Is Us at second place. These are the two shows that I wait for every week with anticipation. PLEASE DO NOT CANCEL THIS AWESOME AMAZING SHOW!!! I LOVE this show, i can’t wait every week for a new episode.. this show is absolutely one of the best shows i have ever seen, the story line is amazing, the characters are incredible the show is just indescribably amazing!! Grey’s just keeps getting better! Keep it coming.. there’s more to explore especially with new characters.. new marriages romances. Season 15 started back with the real surgery visuals that we’ve missed from a couple seasons.. glad to see the old Grey’s back!! Bring on more seasons.. we are never bored! !